It’s Wednesday. It’s blog day. It’s also one of those days. People who have never fought depression probably can’t imagine what it’s like to wake up depressed. It’s hard to face waking up at all when you know as soon as you open your eyes that the day is going to be a battle day. It’s hard to throw off the blankets and put your feet on the floor. It’s hard to stumble to the kitchen and put water on to heat while it’s still dark outside and even darker inside. Just getting up today was a triumph. That was a battle won, right there. Fixing my coffee, getting my notebook, writing Morning Pages…every little action was a battle won. I knew the big battle would be convincing myself to Sweat to the Oldies. There is never a time I need it more than when I wake up depressed and there is never a time when I feel less like doing it. That’s why I need Richard Simmons. I need to get a good workout and I can’t depend on my depressed self to do anything except follow instructions. I don’t have enough motivation to do a series of things. I can do one thing. I can put on my workout clothes. Then I can do another thing. I can go into the living room and turn on the DVD. After that, I just follow Richard. He gets me through an hour-long workout, one little exercise at a time. At some point in the middle of that workout, I start to feel better. I thank God for Richard Simmons. I never in my life had a regular workout routine until I found Sweatin’ to the Oldies 2 and discovered how much my mood improves after an hour’s worth of exercise. I could never keep up with an exercise routine for the sake of my figure. I couldn’t even do it for the sake of my health. I don’t do it now for fitness. I do it because it never fails to bring light into my darkness. I suppose I’ve written about this before. I will probably write about it again, some dark Wednesday when, one more time, it pulls me away from the edge of the pit. Today is blog day and it’s one of those days. I promised myself I would write every week and I promised myself I would tell the truth. The truth is, today was a bad day and Sweatin’ to the Oldies made it better. This entry was posted in Uncategorized and tagged depression, exercise, Richard Simmons, Sweatin' to the Oldies, Sweatin' to the Oldies 2 on April 29, 2015 by releaf1954. I am about to get crazy busy. In just four weeks, I will be leaving for the Florida Folk Festival. Two days ago, our yearly huge order of blanks arrived. I started pre-washing them yesterday. I continued that task today, while also beginning to put things into pre-soak. Pre-soaking is something that must be done while the sun shines, so I couldn’t waste this lovely day. There are two more sunny days in the forecast this week, so I will be pre-soaking tomorrow and the next day, too. Then comes the tying and the dyeing and the rinsing and the washing and the drying and the folding and the stuffing into bins. I will be working long hours for the next few weeks, so I’m glad I had a chance to relax at a low-key festival this past weekend. It was the Old-fashioned River Party in Manatee Springs State Park. The festival was just Saturday, but we camped Friday night and Saturday night. Even with a portable hot spot, I couldn’t get internet access, so I was unplugged for nearly three days. Once I accepted the fact that I could not update my games, I had a lovely time just reading, singing and enjoying the great outdoors. My husband had been working on his second handmade kayak for years and he was really pushing in recent weeks because he wanted to have it finished in time for this festival. Manatee Springs has a boat ramp and crystal clear water, so kayaking is a favorite activity there. We brought his first kayak there a couple of years ago and I had a chance to paddle a little bit, but I didn’t go far because I didn’t know what I was doing and I was alone on the water. This time there were two kayaks, so my husband and I were able to go paddling together. That made a huge difference. I still didn’t know what I was doing but he was right there to help me learn. I will admit that I was nervous at first, but I made a conscious decision to put my fear aside so I could enjoy the delightful new experience. It didn’t take long to learn how to use the paddle to control my direction and speed. The morning was calm and we had the springs to ourselves. We paddled out to the Suwannee River, circled a small island there and then paddled back to the boat ramp in Manatee Springs. It was heavenly. I don’t think my husband is going to be able to go kayaking without me any more. I am absolutely hooked. Sunday morning, I decided I wanted to try to use the paints I had brought with me. My husband wanted to get most of the pack-up done early, so I missed the morning light, but I finally escaped about 10:30 and took my supplies up to the sinkhole I had spied out earlier. It’s a favorite spot for scuba diving. The surface of the water is covered with light green duckweed and the dark water shows through in places where divers have disturbed the weeds. 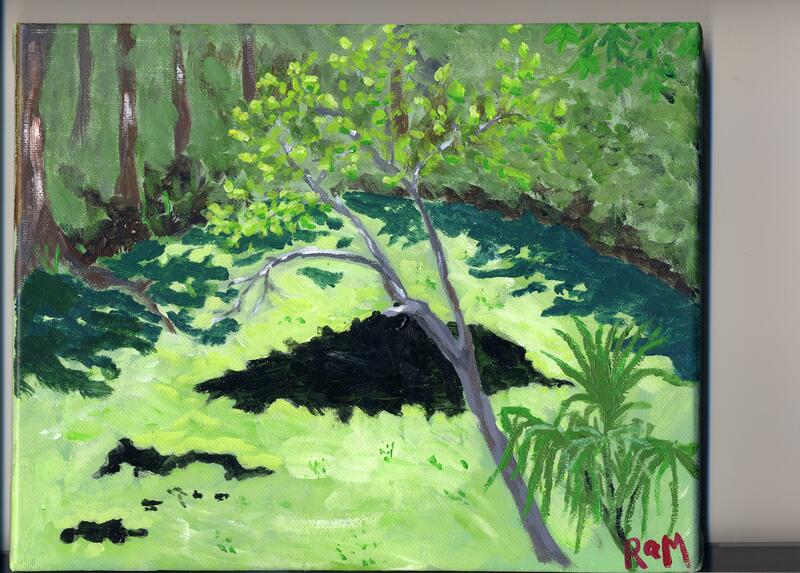 Painting the sinkhole was an ambitious plan. Way too ambitious, as it turned out. That’s okay, though. I learned a whole lot while I was working on it. I learned how many things I can comfortably carry along a woodland trail and how much flat space I need to set them all out and work with them. I learned how fast acrylic paints dry in the hot sun, even when there’s a Sta-Wet palette involved. I learned how hard it is to work quickly, especially when there are people around asking questions. These are important things to know and now I know them. 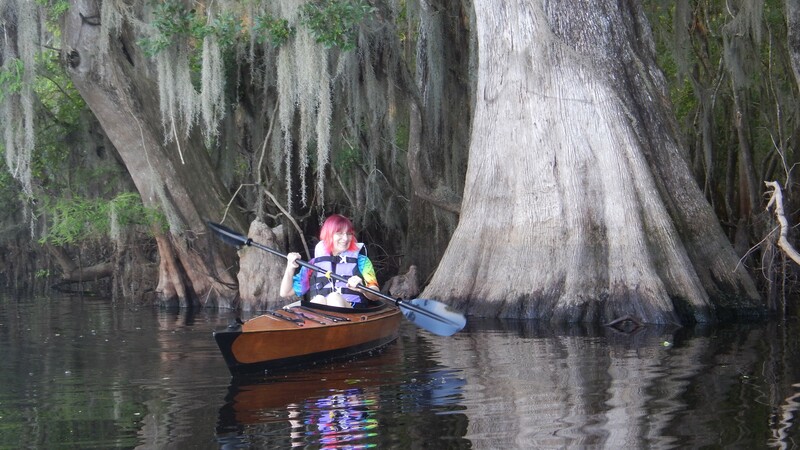 This entry was posted in Uncategorized and tagged camping, kayaking, Manatee Springs, Old Fashioned River Party, painting, River Party, singing, sinkhole on April 22, 2015 by releaf1954. I knew today would be blog day and I knew I wanted to have a new painting to blog about, but I sure didn’t know how much I would resist actually painting something outdoors. It’s my big dream. I should wake up in the morning excited at the possibility of trying it, right? Instead, I’ve been a little bit terrified of trying it, all week long. I procrastinated most of the week away and then, yesterday, I decided I really had to make myself paint something – anything. I put on some old clothes. I checked my painting kit and made sure all the paints were in there, along with brushes, tiny canvases, a small panel, flow medium and a collapsible container for water. I checked my Sta-Wet palette to see if the paints had stayed wet. They had. I got a bottle of water and I started looking around for some kind of container to bring the yucky water home in. That stumped me for a while. Then I went to the garage to look for my tie-dyeing apron. I did not find my apron, but I did find lots of empty dye containers. I rinsed one out and put it with my painting supplies. It was getting pretty warm outside by then, so I packed a couple of small cans of Coke in a cooler and put that with my painting supplies. I added a folding chair to the growing pile of things I was planning to load into my car. I put some larger canvases in a bag. I started loading these things up. It took several trips to the car and back, but I finally felt ready to venture out into the world. I got in the car and drove to a nearby park. 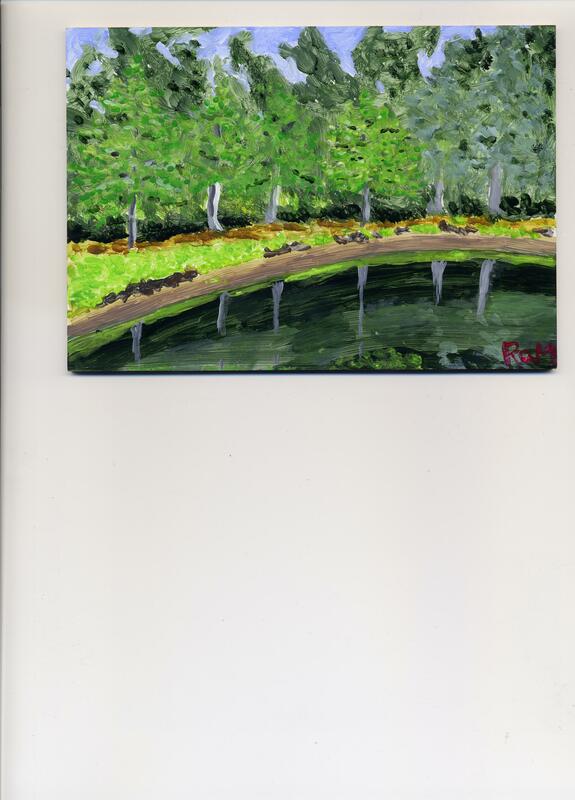 I drove around the park, looking for something I could paint. Nothing caught my eye. I drove to another park and started slowly driving by the playground, while mothers of small children eyed me with suspicion. I saw an attractive wooden building I remembered from my Girl Scout days, but there was no way to park close enough to it to paint it from my car. By this time, I had decided that I wanted to stay in my car. I didn’t think I would be shy about painting in public, but it turned out I was not just shy, but terrified. I wanted to find something I could paint from my car. I kept driving. Finally, at the other end of the park, I spied a wooden fence and a small palmetto. I thought that I might be able to paint that. I parked the car. I took out a sketchbook and did a quick sketch of the scene. I quickly realized that all that stuff I learned about perspective would come in handy if I could just put it into practice on that fence. I did my best and finished my sketch. Then I pulled out a toned canvas and started sketching on that. Soon, I was ready to try adding some paint. I looked around for my Sta-Wet palette. It wasn’t there. Somehow, I had loaded my pile of supplies into my car and left the Sta-Wet palette at home. I couldn’t paint without a palette and it was getting pretty hot in the car by then, anyway, so I gave up and went home. This morning, I tried again. I looked at the canvas with the sketch on it and the perspective was really pretty horrible. I decided to try a whole different park and whole different idea. The park I found today has a lake with trees around it. This time, I had loaded up my Sta-Wet palette, so I could actually try painting once I finished my sketch. Sigh…I still have no idea how to paint a landscape en plein air, but I plan to learn by trial and error, and that means I have to make a lot of errors. It’s hard to share this early attempt, but I am trying to remember that I will get better and my later attempts will look great when compared to this one. This entry was posted in Uncategorized and tagged painting, plein air, resistance on April 15, 2015 by releaf1954. Another week has passed and it’s time to come up with a blog post. It sure would be nice if I had a new painting to talk about, but I don’t. Sad but true. I wanted it to happen. I thought it would happen. It just didn’t happen. There was a tie-dye inventory taking up a lot of my time. There was Easter. I spent that at a family gathering seventy miles from home, so I didn’t have any painting time that day. There was visiting time and eating time and walking time, but no painting time. No regrets there. I love our family gatherings. Okay, but there were seven whole days in that week. Surely I could have squeezed in some painting time somewhere, right? One would think so. One would definitely think so, unless one happened to be a fan of an app game called “Magic Piano.” Is anyone out there such a fan? If you are, you know what Magic Piano did this week. For my readers who are not fans, I will explain. Magic Piano is a game that lets you play real pieces of music by tapping dots on the screen. You earn game currency, called “smoola,” by watching ads. When you have enough smoola, you use it to buy a song. The song rolls down the screen as a series of dots. When the dots reach a certain line on the screen, you tap them. If you see one dot, you tap that with one finger. It it’s two dots, you need to use two fingers. Three dots, three fingers and four dots, four fingers. Easy peasy, right? Actually, it’s pretty challenging. Not real piano challenging, but still challenging. When I first started playing, the single notes were all green and all the notes in chords were yellow. It was pretty easy to get mixed up and tap the wrong number, but the game was so addictive, I kept trying for perfection on every song. Some songs are easy, like “A Tisket, a Tasket.” Then there are the difficult songs, like Bach’s “Fugue in D Minor.” Yes, they do have the Toccata as well, but the Fugue is so long, the Toccata is a whole separate song, costing a whole separate amount of smoola. I love most of the songs, but the ones I find particularly irresistible are the themes from video games. They have Dragon Warrior and Zelda and Mario. I play those a lot, but the ones that I can’t resist are the Battle Music Medley and Boss Music Medley from the Final Fantasy games. I love those medleys, and I became a little obsessed with them. 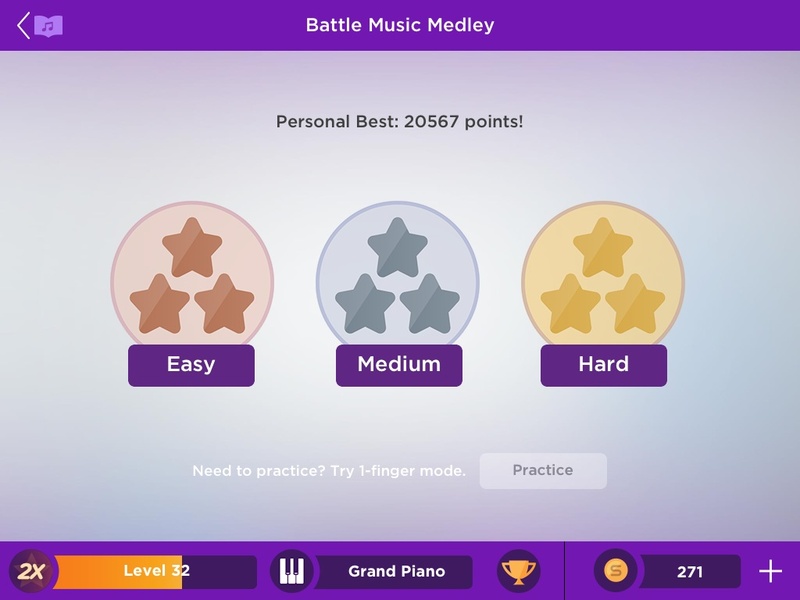 I had been trying for weeks (maybe months; I tend to lose all track of time when I’m playing Magic Piano) to break 20,000 points on the Battle Music Medley. Until recently, my best score was 19,991. I tried and tried and tried to break 20,000, but I just couldn’t do it. This week, Magic Piano did an update and a wonderful miracle occurred. They changed the dot colors from just two to four. There is now a different color for each possible number of dots. This makes a huge difference. See, I did accomplish something this week. This entry was posted in Uncategorized and tagged app games, Magic Piano, procrastination, video games on April 8, 2015 by releaf1954. I set a new blog goal last week, so I was really hoping to have made some progress on that goal by now. All I had to do was paint something outdoors. The resistance was strong, though. I thought a lot about painting, but I didn’t paint. 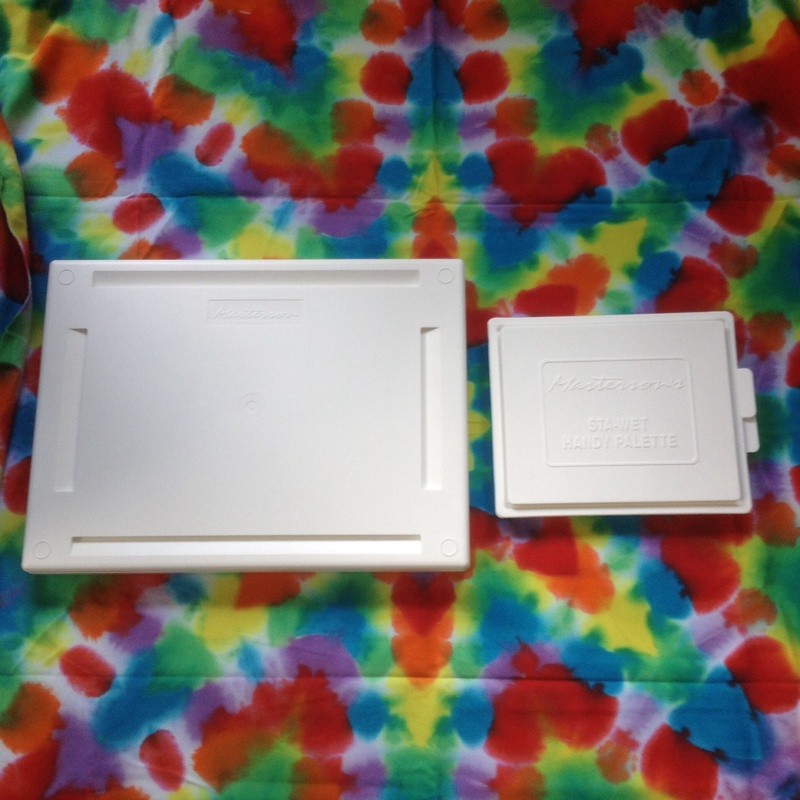 Yesterday, I even put on my painting clothes and set up my new Sta-Wet palette. Yes, I have a new Sta-Wet palette. If I have a stalker-type fan out there, you may remember that I gave myself a Sta-Wet Palette at the end of my first blog year, and then you never heard another thing about it. As soon as I had acquired a cute Sta-Wet palette, I was sure I would rush right home and use it to create the first of my fifty plein air paintings. I was reasonably sure. Anyway, I thought it might happen. I was wrong. I was tired. Something came up. No plein air painting occurred. Not that day. Not the next day or the day after. Not yesterday, either. I was seriously looking at the possibility of having to write one more blog post about procrastination. I couldn’t face that, so this morning, I finally did something. I took my paints and my cute palette into the back yard and I looked around. 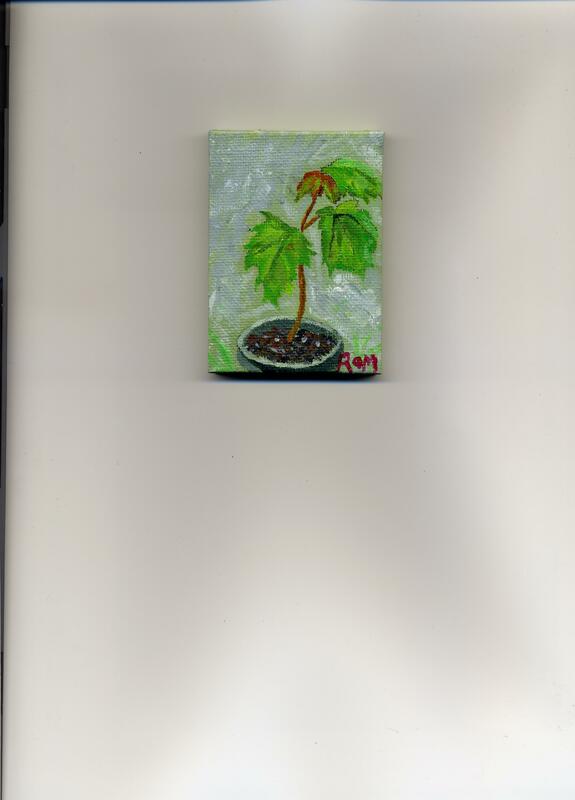 My husband had been potting things up recently and a maple seedling caught my eye. I needed to paint something I found personally eye-catching and that was it. It’s itty bitty, but I painted it outdoors, so it counts. This entry was posted in Uncategorized and tagged goals, painting, plein air, procrastination, sta-wet palette on April 1, 2015 by releaf1954.